The compact whole house filter pictured above is a decade and a half old. While age may have taken its toll on its appearance, the unit has functioned flawlessly over the years with no more care than an annual cartridge replacement. The filter is protected from freezing in winter by a removable cover. A bypass valve is a handy addition to a filter. 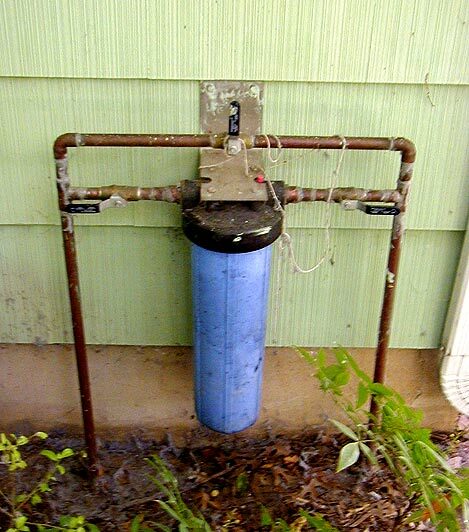 It allows sending water to the home even if the filter has to be taken out of service for repair or replacement. In this installer-built bypass system, water enters from the right. The filter is shown in service position. The top valve is closed and the two lower valves are open. To bypass the filter, close the lower right valve and open the top valve. With both lower valves closed, water (unfiltered) can be sent to the home even if the filter is disabled or removed.